Happy Bloggers Challenge Friday! Guess I've been listening to a little too much Toby Keith, with all these cowboy/cowgirl projects! I'm playing a little catch up this week with a few challenges so I decided to theme my post so that I could put them all in together. As always, Friday's on my blog are for the Bloggers Challenge - this weeks is one of my favorites - Reuse/Recycle. A pretty wide open theme, you can Alter Something, Reuse Something from a previous project, Recycle something (perhaps it's something someone "gifted" you -- you get the idea. All of my projects fit into the Reuse/Recycle Theme, and a few fit some other challenges, noted below the projects. 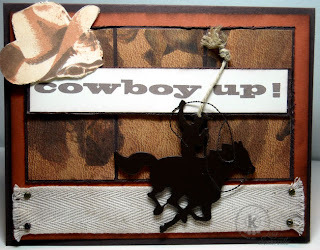 All stamps used on my projects are from two of Kitchen Sink Stamps latest releases: Multi Step Cowboy Hat and Multi Step Cowboy Boots. With a little encouragement, I've finally come up with a pattern for a Three Place Test Tube Holder. You'll Find my other patterns linked in on my sidebar (they are in PDF format - I originally had them hosted at Scrib) if you are looking for samples of what I created with the Test Tube Holder Patterns, click here. My Recycled item Corrugated Cardboard. Click here for my Test Tube Holder Template. Recycled item for Bloggers Challenge - Paisley Ribbon from packaging. Cowgirls Rule is a fun ribbon I found at Hobby Lobby. Have you ever heard the term "cowboy up"? I hadn't, so I went to look it up before I added it to my project. It means: when things are getting tough, dust off and keep trying. What did I recycle here? The Twill is actually a piece that was on a Ribbon Sampler I had, it just happened to be the right length. The Metal piece, is a Christmas Ornament (found at Hobby Lobby). Thanks so much for stopping by, be sure to click on the Bloggers Challenge Logo on my sidebar to see what the other team members did for the Reuse/Recycle Challenge. What a wonderful test tube holder, Lisa. Great idea! Thanks for joining us at SDC 17. What an awesome, unique project! 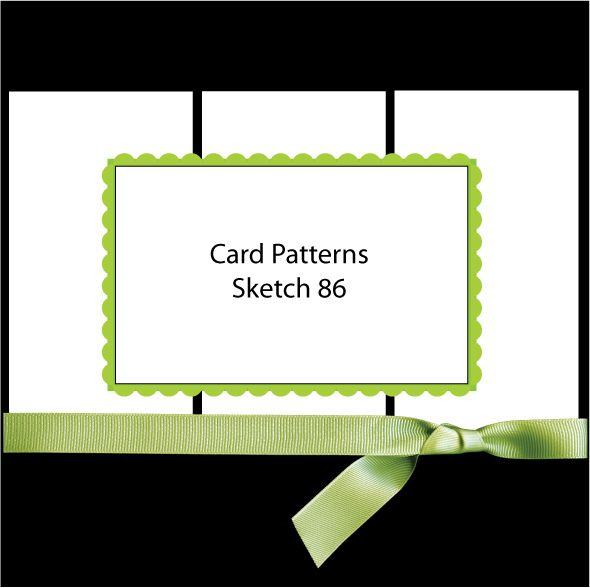 :) The Design Team are really pleased that you joined us for the Simon Says Stamp and Show Challenge this week- Thank you! Love the cowboy up card and the cowgirl card is darling. BTW-I'm not a huge country music fan but I *love* Toby Keith's music. 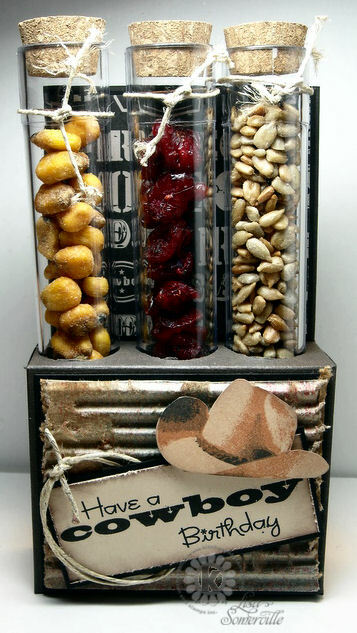 I LOVE that test tube idea and it looks so good with how you decorated it. Wow! Great idea with the cowboy! Thanks for teaching me something new in English! :) Thanks for playing along with CP this week! Now you have me singing that song! Think I have all of Toby's music! What a great idea for holding snacks!! All three projects are fabulous! Have a wonderful weekend, Lisa!! You continue to amaze me. Awesome, awesome, awesome. By the way, I'm not at all into country western, but I do know who Gene and Roy are from the song lyrics. I think that might be admitting my age. What better inspiration than Toby Keith!! LOL I too know who Gene and Roy are or were. You three would make Toby proud! Very clever projects and now I have that great toby keith song stuck in my head! This is really cute! I haven't tried these test tubes and perhaps this will push me over the edge. Wow you've been a busy girl with thse projects. They are all fabulous. Love the Test Tube holder. Since this is the PBR Bull Riding Finals this week for me these projects were right up my alley. Long Live Cowboys/Cowgirls! These are all so cute! I love that you were able to find coordinating ribbon and a Christmas ornament that coordinated so perfectly!! Wonderful set! Love the test tube holder! I love all your cowboy stuff and I do love country music. The first time I heard "Cowboy Up" was in a Woody Harelson movie, I think it was called the Cowboy Way. 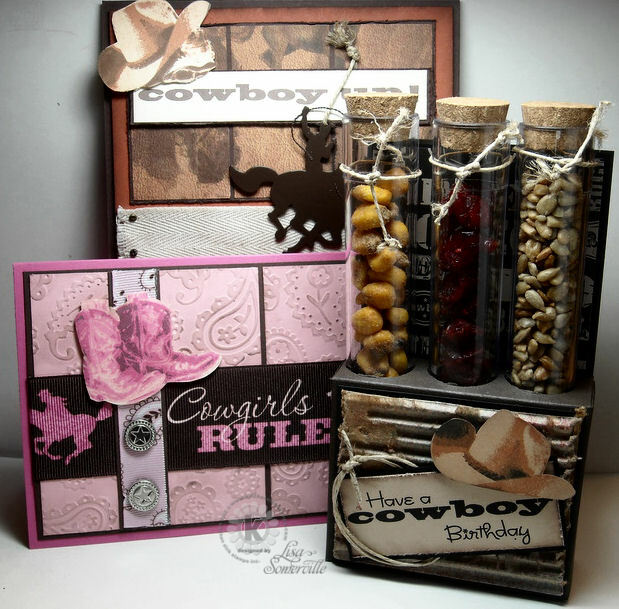 Your cowgirl card is adorable and those test tubes are always fun. Excellent work. What FUN! Maybe if I listened to Toby Keith I could create like you! Fabulous artwork Lisa! Really fun projects for all those challenges, Lisa...great theme, too! What a wonderful collection of cowboy and cowgirl projects!! You sometime leave me speechless!! AWESOME job! 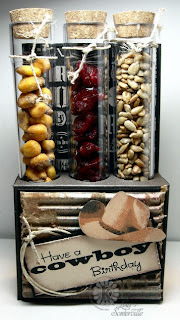 What a wonderful theme and test tube holder! These are all great projects Lisa, awesome! These are all super cool! I love everyone one of them ... ok, so I'm a little partial to the pink (it's got to be the boots). Thanks for sharing! Wow!! What great projects. 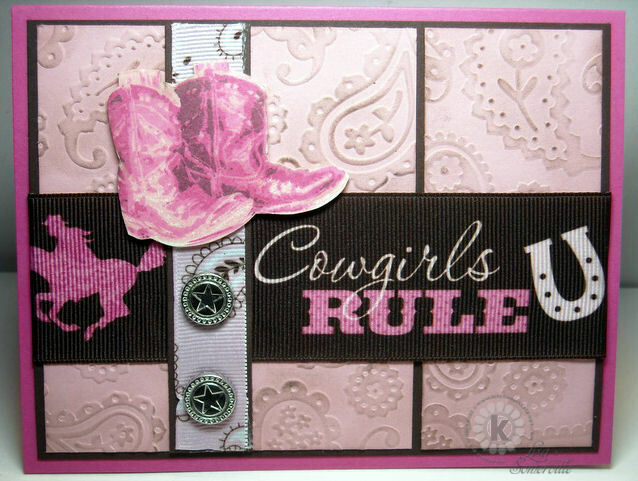 I love the pink cowgirl card!! Wow, cowgirl! Y'all been busy!! LOL! Love all of your projects in this post. I think I'm going to be "lost" on your site for a while - gosh - drewl! 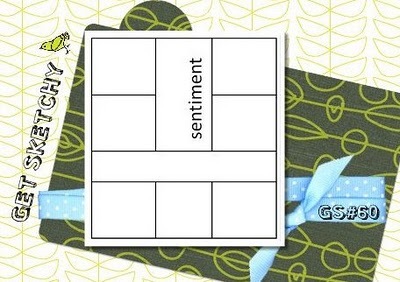 Thank you so much for joing us for the Stampotique Designers Challenge (errr roundup! LOL!) this week! I love these sensational creations, Lisa! Each one is more fabulous than the one before!! What stunning work! Fab job on the recycle! Thanks for joining us at tt this week. No more thowing away those cardboard boxes!!! What a great recycle idea...Love it! !